The Dharma family at Drikung Dharma Surya Center (DDSC) wishes you our most sincere “Tashi Delek” and Happy New Year 2017 with abundant blessings and love. First and foremost, we wish to thank you very much for your faithful and unconditional support to contribute towards the fulfillment of the enriching mission of DDSC. We pray that DDSC temple continues to abide for as long as sentient beings exist and that each one of you continues to be the causes to transform our troubled world into a kinder, happier, friendlier, harmonious and peaceful one! 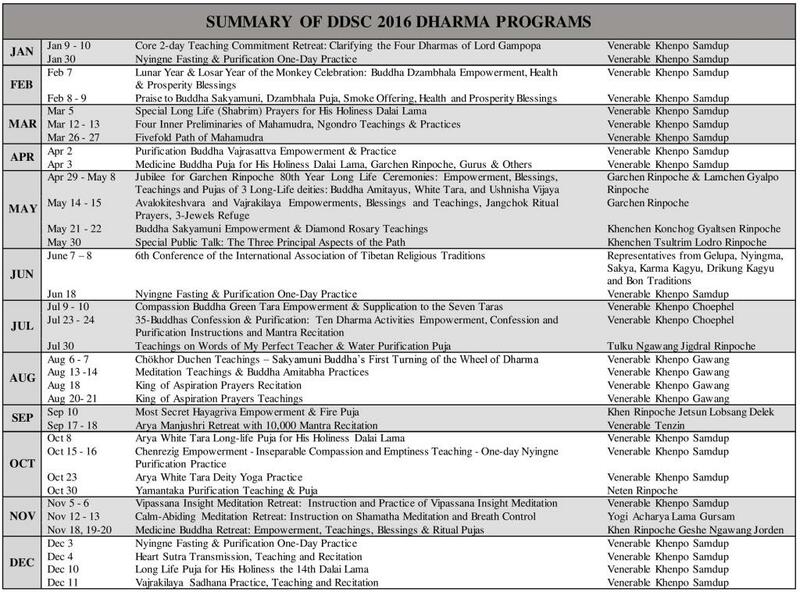 With the motivation to promote Buddhist and universal spiritual values and to benefit all beings without exception, we have successfully organized and offered a total of thirty-five (35) dharma programs and retreats in the past 12 months of 2016, as summarized in the table below. With the blessings and under guidance of Garchen Rinpoche, we also launched the Garchen Children’s Practice program every Sunday for kids at ages from 5-12 to learn the fundamental tenets and practices of BuddhaDharma. 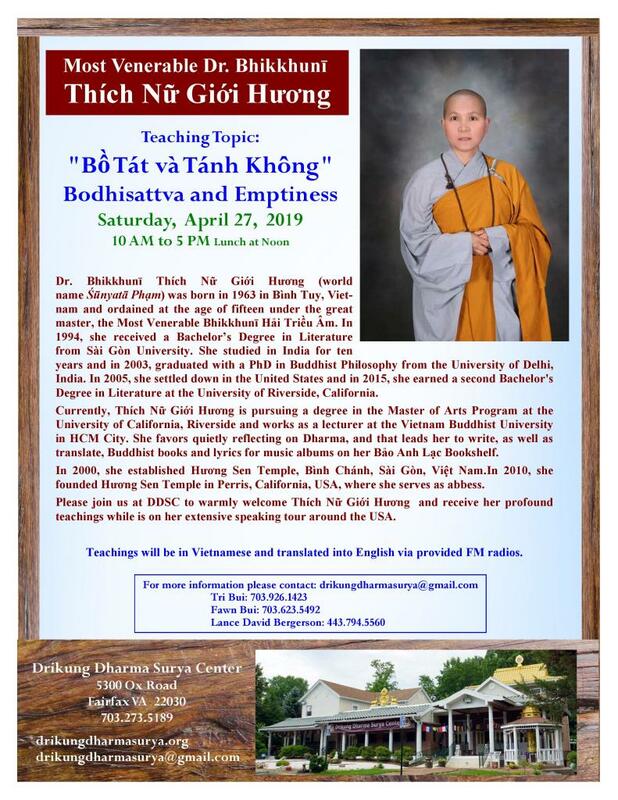 Buddhism 101 and Meditation weekly classes have been provided for beginners and students from local colleges and high schools. We have completed the construction of the pagoda housing a special large prayer wheel, which Garchen Rinpoche has advised to locate at the outside corner of the temple’s Shrine Hall. Billions of mantras of Buddhas, Deities and Protectors will be soon installed and consecrated. We have been able to do and accomplish all that and many more in 2016 because we have the support from many incredible, wonderful individuals like you with donated funds, time, energy, space and growing volunteer workforce. Yes, each one of you, near and far, has been a valuable member of the Drikung Dharma Surya family, and an integral part of its growth and success. THANK YOU, THANK YOU, THANK YOU! Our aspirations and actions do not stop here, as we continue to work tirelessly to carry on the envisioned BuddhaDharma mission and to fulfill the aspirations and the visions that Garchen Rinpoche and His Holiness Drikung Kyabgön Chetsang have guided us. Just to name a few of our forthcoming plans, we have taken the lead in organizing and hosting the 2017 International Vesak Festival at DDSC temple on June 3, 2017, as sponsored by the Washington D.C. International Buddhist Committee (IBC). Buddhists monks, lay persons and staff from temples representing Theravada, Mahayana and Vajrayana traditions and such countries as Sri Lanka, Thailand, Myanmar, Cambodia, Lao, Vietnam, Nepal, South Korea, Japan, China, Mongolia and Tibetan are expected to join and celebrate this Special Event. DDSC upcoming January 2017 programs are already scheduled, to include the Special 5-day closed commitment Great Drikung Phowa Chenmo Retreat with Venerable Khenpo Samdup and Lama Thubten Nima. See DDSC Homepage http://drikungdharmasurya.org/. Whenever possible, we plan to install a Special HUNG Logo (designed by Garchen Rinpoche) on top of the temple roof, to build a paved walkway surrounding the temple for circumambulation, and to improve the deteriorated asphalt parking lot. 2016 has been an auspicious year, but I am thrilled to invite you to gear up and get ready for an exciting 2017. As the Holiday Season is just around the corner, Drikung Dharma Surya Center (DDSC) family wishes you our most sincere “Tashi Delek”. May the blessings of the Precious Ones fill your heart with love, joy, peace and happiness! First and foremost, we wish to thank you very much for your faithful and unconditional support to contribute towards the fulfillment of the enriching mission of DDSC. During this time of giving, please take a minute to consider the mission, roles and work of DDSC. We sincerely ask for your donation and support in many ways you can. No donation is too small nor too large. All donations are 100% tax deductible under 501(c)(3) IRS Code. See http://drikungdharmasurya.org/physical-center-fundraising-campaign/. I pray that DDSC temple will abide for as long as sentient beings exist and that each one of you continue to be the causes to transform our troubled world into a kinder, happier, friendlier, harmonious and peaceful one! As the end of year 2015 approaches, I would like to reflect on a few highlights that DDSC has accomplished during the past 12 months. It has been an electrifying ride that would not have been possible without the support of so many incredible, wonderful individuals like you. With the blessings of the Three Jewels, the glorious Drikung Kagyu Gurus/Masters, Protectress Achi Chokyi Drolma, and Garchen Rinpoche, DDSC officially acquired a permanent physical temple on 29 May 2015, in Fairfax County of Northern Virginia, USA. This is also the result of all the work that many of us have been cultivating and performing in many life times, not just this life time, not just the past few years. That is our samaya, that is the love, and that is the bodhicitta that have actually brought all of us together in this very life to continue to benefit all beings. Many dharma brothers, sisters and friends, from all walks of life within the Washington DC metropolitan area, came and gave their hands and unconditional love to work on many important renovation tasks and miraculously transform it into a sacred temple. See http://drikungdharmasurya.org/temple-renovation/. Whether you have given monetary gifts, or contribution of services such as time, labor, skills, or through rejoicing and training your mind – it takes all kinds of thread to make a complete quilt, and you are the ones who have helped make that possible! Yes, each one of you, near and far, has been a valuable member of the Drikung Dharma Surya family, and an integral part of its growth and success. Above all, DDSC temple is for everyone and by everyone – the spiritual home of everyone. Our sangha is, in fact, representative of the international Buddhist communities, including Tibetan, Vietnamese, Chinese, Korean, Mongolian, Bhutanese, Nepalese, Indian, Lao, and American of various originalities. Even though we are different in look, races, languages and cultures, we work very well together in great harmony to serve and benefit others like one big family under the Buddha! Besides regular monthly and weekly dharma programs provided at DDSC temple, we organized a Special 4-day Retreat Amitabha Millions Mantras led by His Holiness Drikung Kyabgön Chetsang in May to pray for world peace and for all beings affected by the massive 7.9 earthquake that struck Nepal and Northern India. To spread the BuddhaDharma far and wide, we worked with Partners for Tibetan Education (PTE) to host and support a Special 2-day White Tara/Medicine Buddha Retreat at DDSC temple in October with Khen Rinpoche Ngawang Jorden, the current Abbot of Sera Mey Monastic University. We partnered with Tibetan Mongolian Buddhist Cultural Center (TMBCC) and Tashi Kyil Monastery monks to organize and host a Special 8-Day Healing and Blessing Retreat with Medicine Buddha Sand Mandala at the temple during the Thanksgiving week. As part of community outreach activities in building harmonious multi-cultural and inter-religious communities, we also participated in and supported the first Buddhist-Catholic Washington DC regional meeting, “Dialogue of Friendship and Collaborative Action in our Communities”, an initiative originated under Pope Francis’s vision of Dialogue of Fraternity. We have been able to do and accomplish all that in 2015 because we have the support from you with donated funds, time, energy, space and growing workforce of volunteers. Thank you, thank you, and thank you! Our aspirations and actions do not stop here, as we continue to work tirelessly to carry on the envisioned BuddhaDharma mission. I am thrilled to invite you to gear up and get ready for an exciting 2016. I sincerely request you to think and ask yourself what you can do to help DDSC temple to continue to fulfill the aspirations and the visions that Garchen Rinpoche and His Holiness Drikung Kyabgön Chetsang have guided us. Just to name a few of DDSC upcoming plans, our preparation efforts are well underway for a Special Jubilee 80th Year Long Life Ceremonies for beloved Garchen Rinpoche at DDSC Temple from 29 April to 8 May 2016, as well as subsequent Sublime Empowerments and Teachings on 14 May – 15 May 2016. See DDSC Homepage http://drikungdharmasurya.org/. Tai-Chi class and practices for all ages will start in full speed in early January 2016, and most excitedly, we hope to launch soon the “Dharma for Children Program” for kids at ages from 5-12, whose curriculum is being planned and architected by trained and experienced professionals in Fairfax County Public School and Children Buddhist Publication. Whenever financially possible, we plan to install a large Tibetan prayer wheel in its own pagoda, and to start fixing all the temple cracked tiled roofs, damaged soffits, deteriorated front porch decks and asphalt parking lot. 2015 has been an auspicious year, but I can’t wait to embark on the new journey of 2016 with you all. And thanks for being part of this.